A councillor has been suspended after publicly revealing an electricity company was allowed to defer rates payments at a cost of £18,000 to taxpayers. A special disciplinary hearing banned Gina Dowding from Lancaster City Council for three months for breaching its code of conduct. The Green Party councillor had decided to tell the public about a decision to defer a rate payment owed by British Energy, the owners of two Heysham power plants. Councillor Dowding, who is also deputy leader of the North West Green Party, said she was "stunned" by the decision and was considering an appeal. 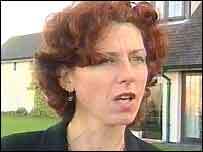 Miss Dowding - a deputy leader of the North West Green Party - had initially voted against the decision, but it was then passed in secret. The European Commission (EC) has since given a provisional ruling that the deferral - which incurred about £18,000 in interest - was "unlawful state aid". Miss Dowding said she went public because she was angry at the interest the payment deferral stood to incur. Her actions led to her being reported to the local councils' watchdog - the Standards Board for England. The EC is currently holding a full investigation into the matter. After Thursday's hearing, Councillor Dowding said: "I am stunned. I actually find it really difficult to believe it. It just doesn't' make sense. "I haven't met anybody who can understand why you should be punished for informing the public?" In October, British Energy sent a cheque of £27,469 to Lancaster City Council to cover losses including the interest incurred.